Our permanent dumpster services in Huntsville are classier than most other operations. We take the time to get to know our customers' problems before we get to setting them up with a dumpster. Since a lot of our customers are setting up their bins for the first time, we like to explain the service in its entirety before we jump right into the trash service itself. This way our customers can be rest assured that they are working with a great company that caters to the demands of their business. 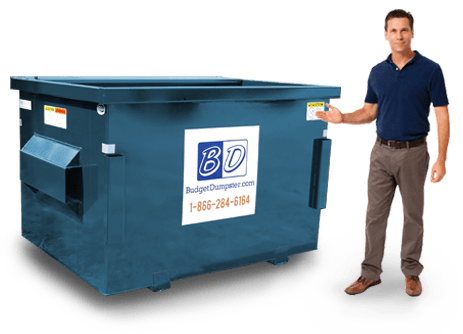 Whether you have a four story office building to manage or a warehouse full of thousands of shelves of product, we'll be able to provide you with the perfect dumpster that fits the size of your business! 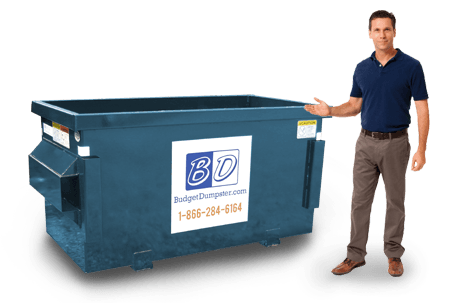 Budget Dumpster makes it very easy to take out the trash. First, we get you set up with the right bin size, whether it's a compact 2 yarder or a large towering 8 yarder. Then we get you set up with the right pickup schedule for your business. We can come out as often or as little as you need us to, allowing you to determine the best service for your waste stream. 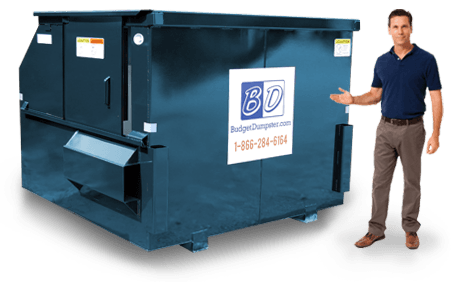 Once all that is taken care of we send you your dumpster and start making the rounds like clockwork. All you have to do is fill'er up and we'll make sure all that garbage is out of hands in a jiffy. The 2 yard dumpster is great for taking care of small waste streams not in excess of 800 lbs. per week. The most common customers of this size include small, local shops that have very minimal amounts of trash to dispose of each week. These bins are no longer than 3 feet, with a maximum width of 6 feet. As for their height, most max out at 3 feet, bringing them up to about waist high. This makes them quite easy to load, so there's no need to over exert yourself while throwing bag after bag inside! 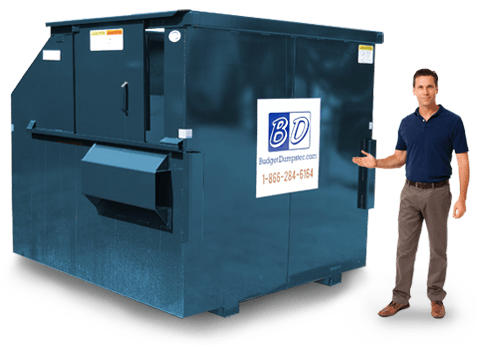 Our 4 yard dumpsters work exceptionally well for many businesses with light-moderate waste streams. Some common users of this size include retailers, companies of 50 or more employees, and wholesalers. These dumpsters are roughly 2 feet taller than the 2 yard at 5 feet tall. But even with the extra height they are just as easy to load up. Our 6 yard dumpsters are a great fit for many larger businesses including warehouses, industrial facilities, and logistics centers. But they are just as good for retailers, especially your average sized supermarket chain or grocer. These bins are large enough to warrant a sliding door that allows users to throw in their smaller bags without having to prop open the lid. These dumpsters are typically 6 feet tall and 5 feet long, making them a bit more difficult to place, but we can easily find a space! The largest dumpsters we offer have a volume of 8 cubic yards, big enough to hold the same capacity as four pickup trucks. These units are great for distribution centers, larger wholesalers, and even manufacturing facilities. They can each handle up to 1600 lbs. of waste, making them the perfect choice for any business with a supremely big waste stream consisting of both regular and bulky trash.